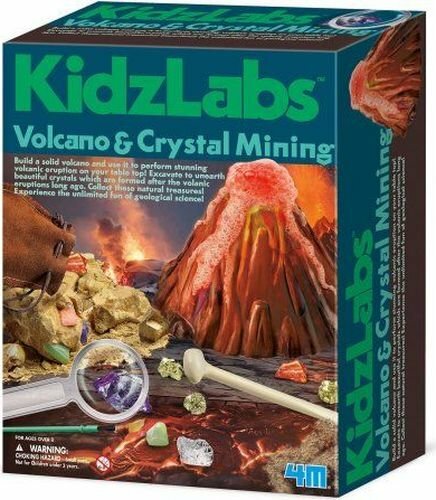 Build a solid volcano and use it to perform a stunning volcanic eruption on your table top! Excavate to unearth beautiful crystals which are formed after the volcano erupts. Collect these natural treasures! Experience the unlimited fun of geological science! Kit includes volcano mold, fine quality plaster mix, paint strip of six colors, paint brush, stirrer, plaster block with crystals and fool's gold pyrites buried inside, a specially designed digging tool, brush, magnifier, display sets with cover and base card, pouch bag, a sheet of fun graphics for decoration and instructions.